I.C.E. annonce de la sortie du « Combat Companion » pour RMC. Trois nouvelles professions, le Champion, l’Elemental Warrior, et le Venturer. Ce sont des semi-spell users spécialisés dans le combat. Un nouveau système d’armure « à la pièce », permettant de mélanger plusieurs bouts d’armures de provenance variée sur un seul personnage. De nouveaux styles de combat, adaptables à RMC ou RMFRP. De nouvelles tables de critiques prenant en compte les modifications liées aux armures à la pièce. L’ouvrage est disponible à la boutique I.C.E., au format PDF ou imprimé dos souple. Attention à d’éventuelles éditions spéciales, limitées, tissu ou autres. Sherry is working her fingers to the bone trying to get this pagemade for us. And things are going great in that regard. Just to whet your appetite, here is a slight overview of what you can find in this upcoming Rolemaster product. First off, we bring you three new professions, the Champion, the Elemental Warrior, and the Venturer. They are semi spell users who specialize in combat, unlike the existing semis. These guys are only for Rolemaster Classic, but we are planning on them being presented to you as RMFRP professions later on down the road. Next, we bring you a whole new armor system. This is for both RMC and RMFRP. The current armor system is based on specific suits of armor, rather than on the overall protectiveness of the armor worn. The new armor system is based on the overall protectiveness of the armor worn. It also incorporates Armor by the Piece rules, as well as rules that change Maneuvering in Armor from multiple skills to just a single skill. This section also finishes off with rules and guidelines regarding special materials, including monster hides. After the section on Armor, we come to Weapon Styles. In this section, we present you with some flexible rules to build combat styles for your characters. These rules allow for melee, ranged, and martial arts. They also allow for flexibility, and even expansion of the style by adding new moves once the style has been learned. You can learn a style for a whole group of weapons or for a single weapon. The styles can also replace a number of the existing combat skills, such as Two Weapon Combo. This section also gives new rules/guidelines for handling Weapon Katas for Martial Arts as well. These rules are also usable for RMC and RMFRP. And the final section of the book is the new combat tables that are required to go along with the new armor system. The combat tables are based on the type of weapon (i.e. short blades, long blades, great blades, bows, crossbows, etc.) and each combat table includes a critical table that is customized to the type of weapon that the combat table is based on. All in all, I think that you will definitely like the finished product as it will give you lots of new options to experiment and play with. The joy of battle ! The song of steel clashing against steel ! Combat is an important part of any game. Combat Companion helps bring combat to life with exciting new rules and options for your game ! 3 New Professions – 3 new semi-spell users, the Champion, the Elemental Warrior, and the Venturer will astound you with their martial prowess ! 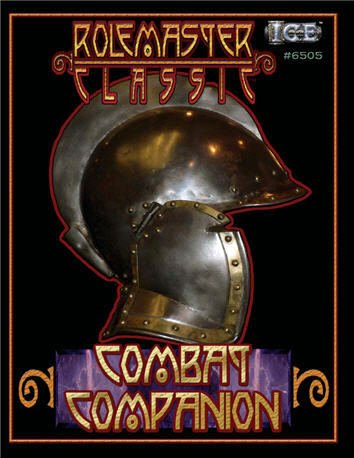 Armor by the Piece Rules – These rules completely change how armor works for Rolemaster. Combat Styles – Rules for building your own combat styles from the ground up, along with a number of interesting examples ! New Attack and Critical Tables – 19 new, single-page, combat tables (attack and critical) that are designed specifically for use with the new armor rules. RMFRP Compatible — Everything but the new professions are fully compatible with RMFRP. Yes, based on WordPress of course and Clarn’s wife logo. Clarn is the owner and founder of the site.